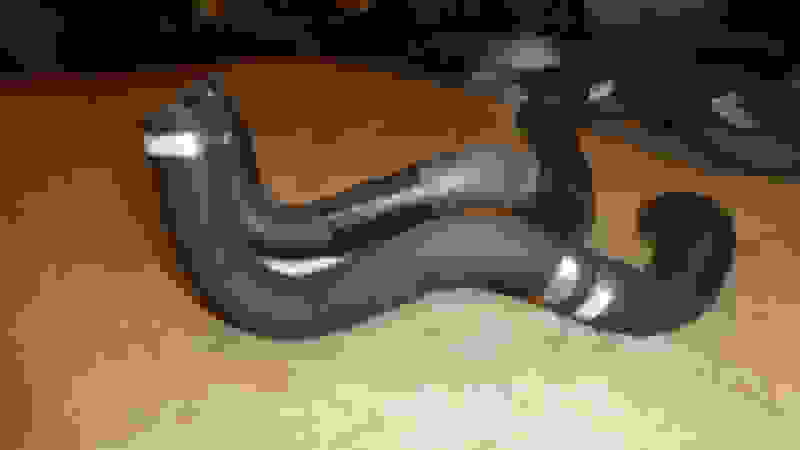 Lower radiator hose for more intercooler tubing clearance - Miata Turbo Forum - Boost cars, acquire cats. My Kraftwerks Rotrex kit came with 1.75" tubing from the supercharger down to the intercooler, even though the outlet port of the Rotrex is two inches. The first silicone bend out of the Rotrex is a reducer. I wanted to replace the 1.75" tubing with 2" tubing, but there's not enough clearance at the elbow in the lower radiator hose where it mates up with my TSE radiator. I don't have a/c or p/s, so I had plenty of room to play with. The hose I kludged together is in the foreground in the pic. I have the original hose propped up by a block of wood so the ends that attach to the radiator are roughly matched. You can see how much wider the bend is in the two-piece hose. The longer piece attaches to the TSE radiator and is a Dayco 70806. The shorter piece is a Dayco 72098. Both needed some trimming where they meet, but it went together easily with no kinking necessary. The hose does not run along the driver's side frame but rather more directly angles towards the block. I don't believe this would work with a/c. Those Dayco hoses are for a 1990 Miata and I happened to have them both on hand. I now have plenty of clearance for 2" I.D. silicone tubing to exit out of the OEM undertray beneath and rearward of the sway bar. Enjoy. New engine:oil in lower radiator hose? What do wrong? Flexible metal hose for lower radiator?